Adaptable Carriage is a novel seating system, designed to enable flexible use of passenger trains for freight transport. Developed with funding from the RSSB’s Tomorrow’s Train Design Today competition, and now through Innovate UK’s First of a Kind Rail programme. Our Adaptable Carriage technology enables seats to be automatically folded and retracted. This quickly creates a clear open-plan space for cargo, bikes, luggage or PRM (Persons of Reduced Mobility). Transporting time-critical goods using off-peak rail services could generate additional profits in excess of £1Bn per annum for UK railways, while reducing delivery times and relieving road congestion. On-demand PRM and luggage space ensure passengers can access the facilities they need, when they need them. Boarding rates are improved, and timetable delays less likely. Engineered to be highly robust, low cost and low weight, the Adaptable Carriage technology can create an open volume in a rail carriage equivalent to an articulated lorry trailer. The system is entirely wall mounted, and is suitable for retro-fit and new build train. Carriage reconfiguration takes less than 1 minute. 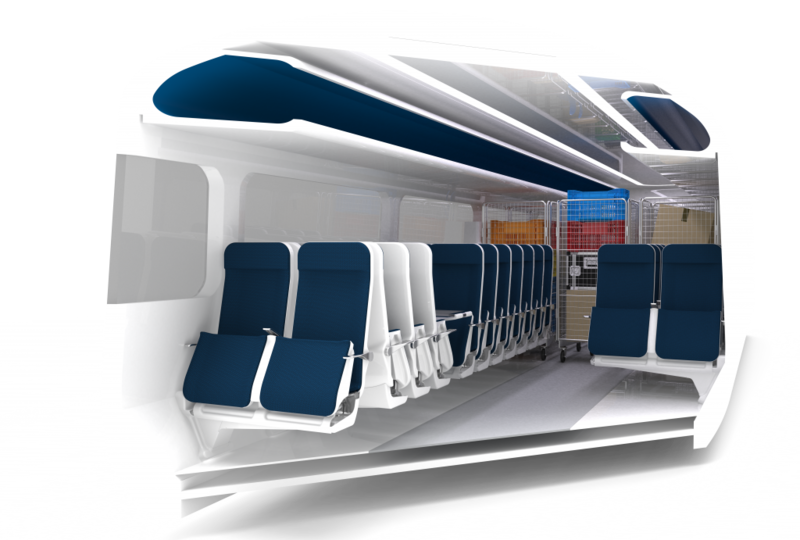 The modular system enables any seating configuration to be accommodated, without impacting passenger capacity, experience or safety. A full scale section of the Adaptable Carriage system was showcased at the 2017 Railtex exhibition, where it received widespread media attention. We are currently carrying out application engineering to install the developed system in a demonstration train with planned rail trials in Winter 2018-19.